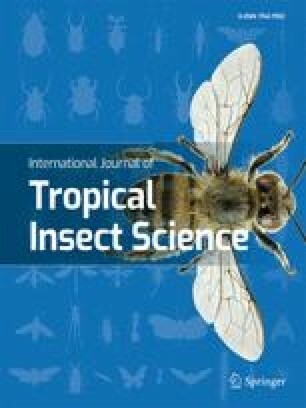 Evaluation of the use of food-dye marking method for the study of sandfly behaviour was carried out in Baringo district, Kenya. A solution of sucrose and food dye was sprayed as bait on the vegetation around a selected source of flies in an animal burrow. The extent of marking and distribution of coloured flies within a radius of 200 m was monitored for four nights. The species caught were Sergentomyia clydei, S. schwetzi, S. antennatus, S. squamipleuris, S. bedfordi, S. africanus S. ingrami and S. affinis and the number of coloured flies was 1017. Feeding on the dyed solution labelled 68.9% of the exiting flies near the burrow and 49.2% of the flies caught at the burrow’s entrance. The total number of coloured flies caught at a distance of 50, 100, 150 and 200 m was similar toa linear distribution. The greater numbers of S. clydei caught at 200 m and the smaller numbers of S. squamipleuris and S. ingrami trapped between 50 and 200 m deviated from this pattern. These results are discussed as well as the possible application of the method. L’evaluation de la methode de marquage par coloration alimentaire a ete faite dans la region de Baringo, au Kenya. Comme nourriture des phlebotomes, une solution de sucrose contenant un colorant alimentaire a ete vaporisee sur la vegetation autour d’un terrier, ce terrier etant source de mouches. La repartition des mouches colorees a ete controlee pendant 4 nuits, dans un rayon de 200 m. Les especes capturees ont ete Sergentomyia clydei, S. schwetzi, S. antennatus, S. squamipleuris, S. bedfordi, S. africanus, S. ingrami et S. affinis. Le nombre total de mouches colorees a ete de 1017. L’alimentation coloree ingeree a marque 68.9% des mouches capturees aux alentours du terrier et 49.2% des celles capturees a son entree. Le nombre total de mouches colorees, capturees dans un rayon de 50, 100, 150 et 200 m. A ete semblable a la distribution linearle calculee, bien qu’il y ait eu quelques variations. Les plus grandes d’entre elles ont ete pour S. clydei capturees a 200 m. et les plus petites pour S. squamipleuris et S. ingrami capturees entre 50 et 200 m.
Ces resultats ont ete discutes ainsi que les possibilites d’application de cette methode.